This fun St. Patrick's Day dessert recipe will bring a smile, literally, to your table. 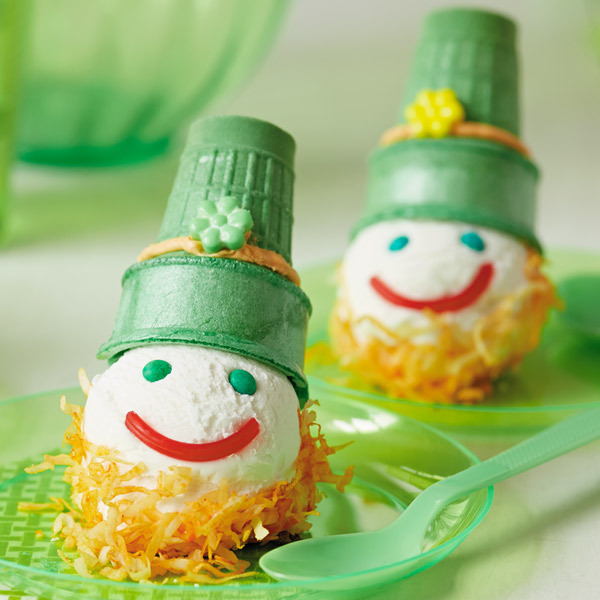 These sweet, smiling leprechauns are made with vanilla ice cream, shredded coconut, candies, sprinkles and a green cake ice-cream cone. The kids will love helping your create these easy, happy-go-lucky St. Patrick's Day treats. An hour before assembling leprechauns, scoop out 4 round ice-cream balls and place them on a baking sheet. Put them back in the freezer for an hour. While ice cream is in freezer, tint coconut. Pour shredded coconut into a zippered baggie and add 2 drops red and 3 drops yellow food coloring. Shake and mix until the coconut is a nice orange color. Then pour coconut into a shallow bowl and set aside. Scoop frosting into a bowl and tint frosting with the same amount of red and yellow food coloring as the coconut. Add tinted frosting to a pastry bag fitted with a small, circle decorating tip. To make hats, carefully pipe a line of frosting around each ice-cream cone to form the hatbands. Add a flower-shaped candy to each hatband. Set aside. After ice cream has firmed up, roll one half of each scoop quickly in the tinted coconut and place on a serving platter, coconut-side down. On the uncovered side of each ice-cream scoop, place 2 large, green sprinkles for eyes and snips of the red licorice wheel for a mouth. Top each with a cone hat. Serve immediately or place serving platter in freezer until ready to serve.